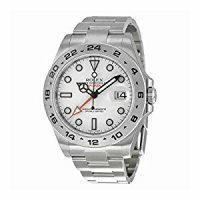 Rolex Explorer II Automatic Men’s Watch Review — Is It Worth Buying in 2019? 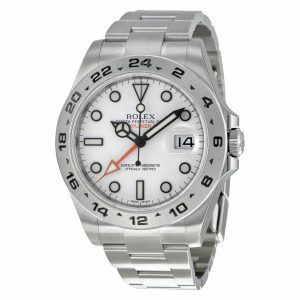 For all those intrinsic adventurers who also appreciate elegance in design and reliable technology, nothing fits the bill better than the Rolex Explorer II White 216570WSO Automatic Stainless Steel Men’s Watch. This masterpiece includes the famous and well placed orange hand with the incredible characteristic 24-hour hand that has made the Rolex Explorer II a global favorite among watch enthusiasts. When Tenzing Norgay stepped foot on the summit of Mt. Everest with a Rolex Explorer strapped dedicatedly on his wrist, he had no idea how huge the name would become. The Rolex Explorer II is a bit different from its predecessor when it comes to uniqueness in design and practicality in function. With the entire world as their playground, Rolex has indeed stayed true to their motto. Presented for the very first time ever in 1971, the innate spirit of the wristwatch is rooted deep in the fundamentals of the Rolex. Since then, the explorer became synonymous with extreme adventures, mountain climbers and nature lovers worldwide. After years of perfecting and fine-tuning this classic wristwatch, the Rolex Explorer II was born, perfect and better in every way. With a more robust steel case, accurate and precise GMT movement and the classic orange hand, the Rolex Explorer II can be counted among the best models with the biggest recognition factor. The company has continued to equip explorers, scientists, and everyday guys for decades, creating a worldwide testing ground for testing chronometers under extreme yet natural conditions. This is the transparent cover on the face of your watch. 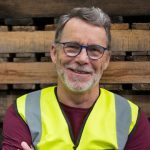 While crystals have been made using a myriad of materials in the past, only a few really dominate the market today. Most watches now have either mineral glass or synthetic sapphire. Mineral crystals might be cheap and do not shatter on hard impact, but they do crack. On the other hand, sapphire crystals are super scratch resistant and it is common to find flawless crystals on even the oldest watches in the world. Luxury watches should feel very well put together and as solid as can possibly be. Always check on the straps and bracelets to see if they seamlessly fit the case without any wiggle room whatsoever. The clasp on the wrist should also feel easy to operate and with a smooth action. If there is a rotating bezel, then it needs to be firmly held in place and not move when in a resting position. Rolex Explorer II watches are especially crowned for their durability. Is a Rolex a Great Investment? Just recently, a rare watch made in the 1940’s managed to garner a whopping $1.2 million. Which watch is this you may ask? Of course, it was none other than a Rolex. When it comes to top-tier chronological masterpieces, you simply can’t go any higher than a Rolex. More and more people developing a much greater awareness and innate appreciation for classic, luxury timepieces. As they begin to look for credible and worthy investments in today’s volatile markets, rare watches have become more than just mere accessories; they are a great investment strategy. And for all those wondering how you can possibly invest in a watch, here are a few reasons why. Rolex watches are renowned worldwide for their exceptional craftsmanship that traditionally increases value up to 15 percent every year. This however largely depends on of the specific timepiece. Investing in a great Rolex could see your investment double in value over the next 5 to 10 years, all depending on the Rolex Explorer II rarity and prestige. The rarer and more prestigious it is, the greater the return on investment. Unlike other investments that have to be safely tucked away, this is not the case with a Rolex. This is one thing that many investors love about a good Rolex is that you do not have to stuff it in your safe or bank deposit vault for it to appreciate. A Rolex can still be thoroughly enjoyed while still earning you some precious bucks. Rolex Explorer II watches not only hold their value, but they can be shown off too.